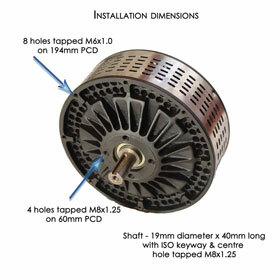 From our experience with different electric motor types, we recommend for most application this special type DC permanent magnet motor. The principle of the ironless "pancake" motor has been known for many years, but this model is the first to be developed for racing, giving power to weight ratios and efficiencies unmatched by conventional small traction motors and is therefore perfect for the electric karts. In the application for rental karts it is oversized, which guarantees a longer life duration as well as a higher reliability. There is no special "commutator". The 8 brushes drive directly on the armature and have a lifetime of several thousand hours. As with most electrical motors this one requires very little maintenance. Only a regular cleaning (blow the dust out of the motor) and frequent control of the mechanical system. 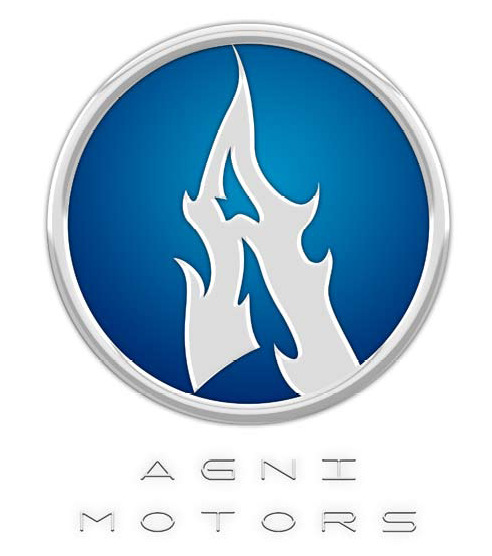 The Agni Motor gives up to 93% efficiency, and it maintains high efficiency over a wide range of loads and speeds. It runs on D.C. up to 60 volts at which it can produce 9 Kilowatts (12 horsepower). The low shaft speed and high torque enable the use of a simple, cheap and efficient transmission in most applications. The Agni motor enables you to get the best possible performance from your battery-powered or solar-powered vehicles, boats or machinery. Please find links below to performance graphs of our motors, please click on the relevant link to see graphs for that specfic series motor. Please Note you will require Adobe Reader in order to view the graphs correctly. Model rpm/V max. V A cont. @48V cont. output power@48V max rpm cont. output power max. power for 5sec. High efficiency (about 93% maximum) gives longer running time and less frequent battery replacement for electric vehicles, boats, water pumps and equipment. For solar-powered applications you need fewer expensive solar panels to get a given amount of power. Can also operate as a generator particularly suitable for electric-arc welding. It can form part of an easily portable welding outfit capable of welding heavy-gauge steel. Weight about 11Kg. Up to 9KW (12 horsepower) at 60 volts, at only 3000 rpm. Applications requiring less power can use lower voltages, giving even lower speeds which in most applications will allow the transmission to be cheaper and more efficient. The motor has a speed of about 50 rpm for each volt. The maximum continuous current varies from about 80 amps at 12 volts to 160 amps at 60 volts; the limiting factor is the flow of cooling air through the motor and the continuous current at low voltages may be increased if ventilation is good. Maximum efficiency is produced when running at about half the maximum continuous current. Normally the motors should be controlled with an electronic speed controller of the type using MOSFETs with a switching frequency of 15 KHz or higher. In some boats and stationary applications where the motor normally runs at full speed most of the time it may instead be controlled with resistors to limit the current on starting; the resistors can be by-passed once the equipment is running. On 24 volts or less where the load has little inertia (for example a hydraulic pump) the motor can be started by direct connection to the supply. With some electronic controllers regenerative braking is possible, giving increased range and longer brake life in vehicles used in stop-start traffic or on hilly roads. Controllers are available from a number of manufacturers; we can advise on the most suitable for your application. vehicles for amusement parks, golf carts etc. Solar powered water pumping, milling etc. Cedric Lynch was born in December 1955 and has from an early age been interested in anything electrical or mechanical. In 1979 he entered a competition organised by the Institution of Mechanical Engineers and the electrical firm Lucas, to find who could make a vehicle to get furthest in two hours on the power of two small car batteries, and came second out of about 50 competitors using a home-made motor which had armature and field laminations cut out from flattened soup cans. For subsequent similar competitions run by the Battery Vehicle Society he developed a better motor, which used permanent magnets and also had the magnetic flux running axially through the armature. In this motor the iron laminations were rectangular, which made it possible to have them commercially made from material intended for this purpose without the expense of a special stamping tool. Because the flux passes through the laminations along one axis only, it became possible to take advantage of grain-oriented material normally used in large transformers. This has much better magnetic properties along the grain orientation but worse properties in other directions, so in the traditional type of motor it gives little or no benefit. This motor went into small-scale production in 1988 with the firm London Innovation and later with LEMCO. In 1989 four of them powered the boat “An Stradag”, driven by the Countess of Arran, to a world record speed for an electric boat of just over 80 km/h (50 mph). The motor was adopted by the Swiss company ASMO for use in its electric go-kart drive systems. Its efficiency extends the life of the batteries and so improves the economics of running an electric karting track. In July 2002 the Danish parent company of LEMCO dismissed Cedric Lynch. An industrial tribunal ruled several months later that the dismissal was unfair and also ordered LEMCO to pay Cedric a large amount of money it owed him. On the same day LEMCO was put into liquidation heavily insolvent. Many of its assets had been transferred over the previous few months to L.M.C., a previously dormant company owned by the same parent company, which has since continued making motors in the UK. Subsequently Cedric got together with his friend Arvind Rabadia, who together with his Brother Hasmuk Rabadia had been thinking of starting a business in India, and set up Agni Motors to make further-improved versions of Cedric's motors.